You've been grating cheese all wrong! While kitchen gadgets with numerous attachments and settings may leave you stumped, most of us are probably certain we know our way round the humble cheese grater. 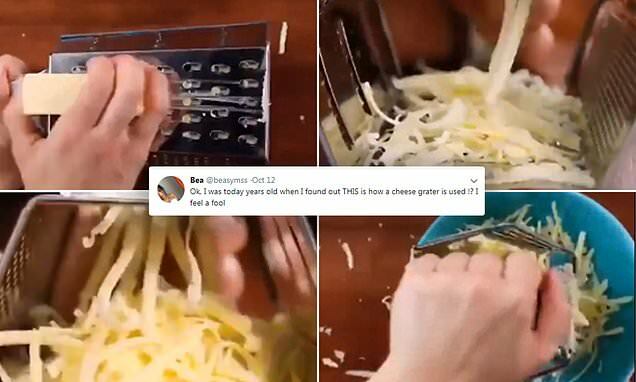 But Twitter user Bea Symons from Nottingham shared a video produced by the food blog menuserved, showing how a grater should be used horizontally rather than upright and admits she 'feels like a fool' for not realising this before. Her tweet captured the attention of other foodies who were equally shocked to learn that they've been using the simple item of kitchen equipment incorrectly. Even Coronation Street star Lucy Fallon tweeted that she was in disbelief a the revalation, saying: 'No actual way'. Bea's tweet has now been liked 60,000 times and shared 19,000 times, proving she was by no means alone in her confusion.